Free shipping. Buy direct from HP. 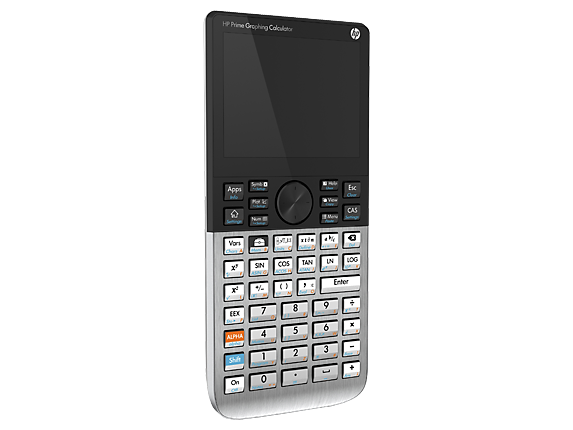 See customer reviews and comparisons for the HP Prime Graphing Wireless Calculator. Upgrades and savings on select products. 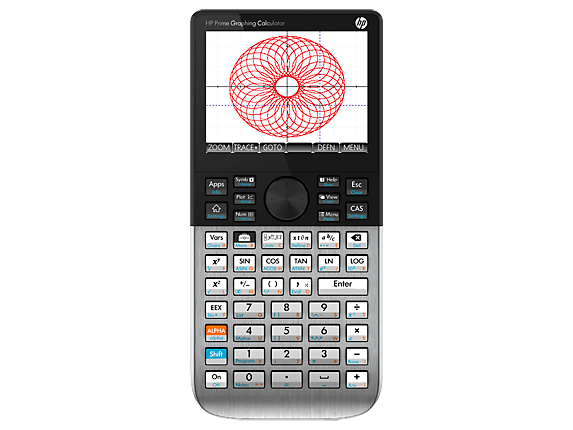 Experience handheld calculating in the age of touch with the HP Prime Graphing Calculator. This full-color, multi-touch calculator has touchscreen or keypad interaction, powerful math applications, formative assessment tools, wireless connectivity, and a long-life, Li-ion rechargeable battery. College Board and IB approved. Rest easy with a calculator that’s College Board-approved for use on the PSAT/NMSQT®, SAT®, SAT® Subject Tests in Mathematics, and select AP® Exams; and International Baccalaureate®-approved for use on IB Diploma Programme examinations.Enjoy a feature-rich calculating experience with familiar HP keypad and a large 3.5-inch diagonal, multi-touch display. So many applications in such a small package. Easily switch between symbolic, graphical, and numerical table views with dedicated buttons. Explore math concepts with Dynamic Geometry, CAS, Advanced Graphing, and spreadsheet applications.Save time and keystrokes with RPN and programmable functions, and see intermediate results while you work.Turn the calculator into a testing tool with test-mode configuration that makes only pre-approved functions available.We don’t stop at hardware. You also get an integrated tool suite. HP Equation Writer supports multiple linear and non-linear equation solving. HP Solve is a time-saving application that allows you to store equations and solve for variables. The calculator you’ll want to hold on to. Say hello to the evolution of handheld calculating in a sleek, slim, brushed metal design that looks great and performs even better. Keep the calculator protected when it’s not in use with the slide-on protective cover.When you need to charge up, the convertible charger works with the USB connection on your PC or a standard AC wall plug. Keypad or touchscreen. You decide. Enjoy a feature-rich calculating experience with a familiar HP keypad and large 3.5-inch diagonal, multi-touch display. 1 Compatible only with HP Prime Graphing Calculator SKU G8X92AA. The HP Prime Wireless Kit is sold separately and includes one PC antenna and 30 wireless modules, with bi-directional transmission range up to 15 meters. 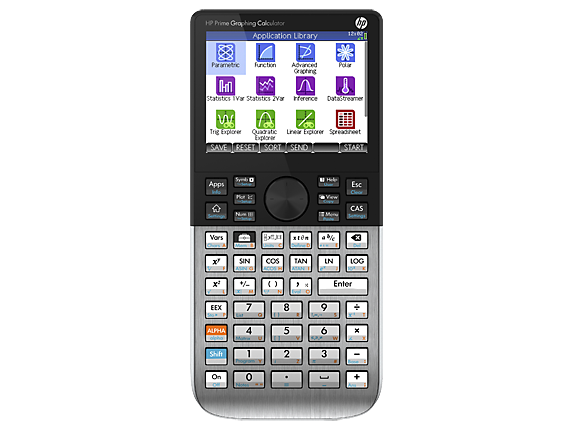 2 The HP Connectivity Kit is included with the HP Prime Graphing Calculator (G8X92AA only). If you want a more efficient way to tackle the toughest problems, the HP Prime graphing calculator was made for you. You'll have a College Board and International Baccalaureate-approved calculator that comes with a ton of features that can make handling any subject a whole lot easier. Because it’s been approved by the College Board and International Baccalaureate, you won’t have to worry about whether you can use your HP graphing calculator when taking your toughest exams. Whether it's the SAT or the PSAT/NMSQT, you'll be able utilize all of the great features that come ready to give you the right answers, time and time again. And with a test-mode configuration, you'll have access to only the functions that are allowed for your particular exam, so you'll never have to worry about having the right device for the job. The 320 x 240 16-bit TColor touch screen allows you to see all of your work with the clarity it takes to get the toughest problems done efficiently. From studying physics, to statistics, to anything in between, you'll have exactly what it takes to accomplish big things with big numbers. Whenever the situation calls for it, you'll be able to easily utilize graphic, symbolic, and numerical table views of your work at the press of a button. For extra saved time, you can even program the functions you need and put reverse polish notation to work to save you from needing to hit any extra keys. If you want extra tools to make your tasks easier, we can help with that too. With the HP Solve application, you can save yourself extra work by easily solving for a variable or storing equations for later use. And when you use HP Equation Writer on your HP Prime graphing calculator, you'll have the tool to take down any linear or nonlinear equations that stand in your way. For a calculator built to take on this school year and the rest to follow, you can't do better than the HP Prime graphing wireless calculator. Its brushed metal frame makes it sturdy enough to take on whatever the classroom throws at it. And with a cover that easily slides on, you can keep your 16-bit TColor touch screen safe from any scratches if it shuffles around in your bag. And when you need to keep your calculator powered up, you'll love the convenient convertible charger that works with a wall plug or your computer's USB port. You shouldn’t have to struggle to take your work to the next level. With the HP Prime graphing calculator, you'll have the perfect solution to ace your toughest subjects, semester after semester.